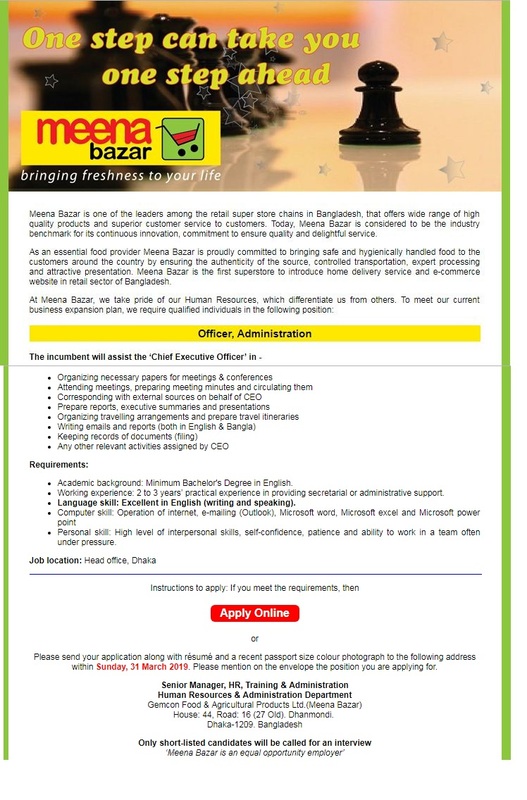 Meena Bazar Job Circular 2019 has been published in daily online job portal and to get from the best jobs and education portal website in BD Jobs Career. As a know,Meena Bazar is one of the leaders among the retail super store chains in Bangladesh, that offers wide range of high quality products and superior customer service. Today, Meena Bazar is considered to be the industry benchmark for its continuous innovation, commitment to ensure quality and delightful service. anyway, good news is recently the Meena Bazar hire new man power for their organization empathy vacancy . The Job Title Name is Executive, Audit and Internal Control. You can see this super shop job all of necessary details in BD Jobs Careers. For you Help, we have already given applying requirements such as published date, application deadline, job circular image, applying process, salary and more. However if you are interested super shop jobs in Bangladesh to see this job circular, then if you think you are suitable for this job, to submit your application by following their instruction with specific time. ■ Organization Name: Meena Bazar Super-shop, Bangladesh. ■ Educational Requirements: Graduate in any discipline from a recognized University. ■ Experience Requirements: At least 2-3 years job experience. Experience in retail sector or hospitality industry is preferred. ■ Other Benefits: As per Company Policy. ■ Applying Procedure: Please send your application along with résumé and a recent passport size colour photo to the following address within Saturday, 20th of October, 2018. Please mention on the envelope the position you are applying for. সকল ধরণের চাকুরীর খবর পেতে যোগ দিন……. This entry was posted in All Jobs, Dhaka Jobs, Graduate Jobs, MBA Jobs, Newspaper Jobs, Observer Newspaper, Private Job and tagged meena bazaar career, meena bazar job circular, meena bazar job circular 2017, meena bazar job vacancy, meena bazar jobs circular 2017, meena jobs bangladesh, meena super shop jobs, showroom salesman job in dhaka by admin. Bookmark the permalink.